Google updated Chrome for Android and iOS today and brought a new data compression feature which helps users to reduce data usage and save money on their mobile plan. The service works similar to Opera Mini. 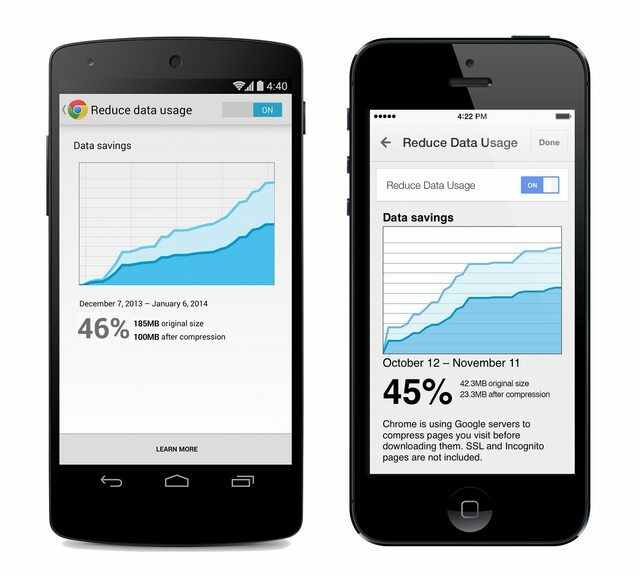 When enabled, Chrome’s data compression and bandwidth management can reduce data usage by up to 50%. For saving data, go to Settings > Bandwidth management > Reduce data usage. Then simply turn the toggle to "On." From this menu, you’ll also be able to track how much bandwidth you save each month as you browse on Chrome. All your data is getting stored and kept. Big Brother is watching. It's just non-HTPS data Google compresses. ISP or even Wi-Fi hotspot providers can also see what are you doing on a non-secured connection.